I don’t know how this happened, but I guess I’m a tomato farmer. Tomatoes are all I’ve thought about all summer. If I’m traveling, I don’t wonder about my boyfriend and cats, I wonder about my tomatoes. Are they getting enough nutrients? Are they getting the right amount of water? Do they need trimming? Are there any pests pestering them? And, most importantly, do they miss me like I miss them? After a few snafus this past Spring (who expects snow in May?!) my babies finally got going. And even now in mid-September, most of my plants are still producing juicy orbs of ridiculous deliciousness. So of course I’ve been using them in everything. And, well, one thing led to another and I guess I don’t have to tell you, that this is how BLT Mac & Cheeze was born. Being late summer, I really wanted this mac to be gardeny. If you have a garden, or a CSA, or just want to use some in-season produce from the grocery, maybe you’ll appreciate that. So I made the “B” out of eggplant (remember: vegans will make bacon out of anything.) For the “L”, arugula is always prolific in the garden, plus I love its muskiness, which goes perfectly with the bright and smoky flavors of the other ingredients. The “cheeze” sauce is just something I threw together, very similar to the Chipotle Mac, but without the pepperiness and perhaps a little more noochy than usual. It’s just a nice creamy backdrop to the more assertive flavors its tossed with. And there you have it: BLT Mac & Cheeze. I hope your summer has been as fruitful as mine (literally and figuratively) and I can’t wait to share some fall recipes with you soon! ~For time management: Get the oven preheating and the water boiling, then prep the eggplant. Once the eggplant is in the oven and the pasta is boiling, you have plenty of time to prep the tomatoes and puree the sauce. ~I was making this for a friend who is sensitive to garlic (I KNOW!) and so I didn’t use it. If, however, you NEEDS your garlic, throw a clove or two into the sauce while it’s pureeing. ~If you forgot to soak the cashews, have no fear. You can boil them for the same creamy effect, and still have this on the table in 30 minutes. Just submerge in boiling water for 15 minutes, drain, and proceed. ~Oh and hey, if you’re doing the oil-free thing, you’ll be happy to note that this recipe is completely oil free if you leave the cooking spray off of the eggplant bacon recipe. To make the sauce: Drain the cashews and place all sauce ingredients in a blender and blend away until completely smooth. Scrape down the sides with a spatula to make sure you get everything. Depending on the strength of your blender this could take from one to five minutes. Taste for salt and pepper, keeping in mind that you want it just a little saltier than you think because it’s going to be poured over all of the other ingredients. When the macaroni is tender, drain it in a colander. Immediately place it back in the pot you boiled it in and stir in the sauce. Place pot on low heat and stir for 3 minutes or so, until the sauce is thickened a bit and everything is deliciously creamy. Taste for salt again. Now toss in the arugula, tomatoes and eggplant bacon, leaving a little extra aside to garnish if you like. Serve! So “gardeny”! Looks delicous. I’ve been meaning to try eggplant bacon forever too. I’m exactly the same when I’m away, worrying about my veggies and, even when I think the courgettes are done for the summer, more pop up! I’ve pretty much started making whatever you post for dinner. Tonight this shall be MINE!!! This looks so delicious! Making it for lunch tomorrow! 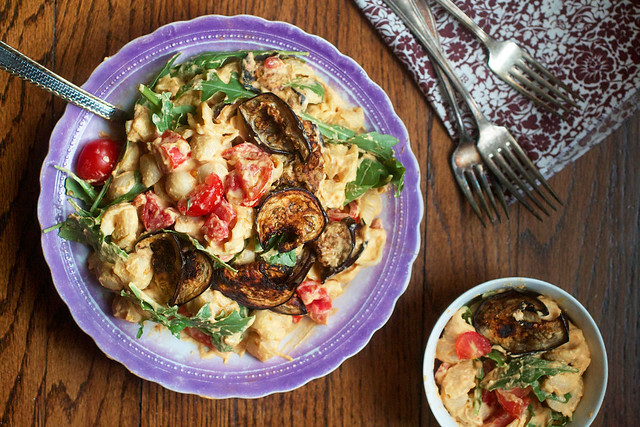 I am pretty much addicted to eggplant bacon anyway – new use for it! Congratulations on a great tomato crop! That mac looks fabulous. 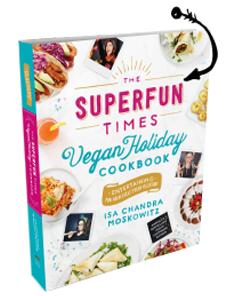 Thank you Isa for making vegan cooking so awesome!! Dumb question I am sure, but cashews make me sick, what would be the most cashew-like creamy alternative nut to use and would you suggest doing anything differently when substituting it? This looks so yummy, thanks for posting it!! I’d use slivered almonds. Soak longer and blend longer, unless you have a high speed blender, like a vitamix. BLT Mac and Cheeze? Oh my, I think I’ve died and gone to heaven. I too have an abundance of tomatoes in my garden. Plus 2 gallons of frozen Roma tomatoes in the freezer just waiting to be made into sauce. This looks incredible Isa! I haven’t attempted vegan mac and cheese yet, but I think I’m going to try this one first! so appreciate the NO OIL thing….keep those recipes coming! Well, this sounds totally amazing! Your tomato babies are gorgeous (lovely photo). Your ‘parenting’ skills are evident. Ohhh Isa, you’ve outdone yourself. This is totally happening this week. I made this tonight for myself, my partner, and vegetarian oldest step-daughter. Big hit! Got lots compliments from everyone and lots of questions about why the eggplant tasted like bacon and how the sauce was so creamy, yet vegan. Great dinner! Thank you so much! That’s what I’m taking about! YUMMMMY! This is a classic Isa dish that makes great use of ingredients you likely already have. The eggplant bacon is so good, I ended up eating half of it before the pasta was finished cooking. Thanks so much for helping me put a dent in my tomatoe, eggplant and greens stash! I made this last night – very tasty! I loved how the cashews made such a creamy sauce. I don’t have liquid smoke so use smokey chipotle Tabasco and that works well. Looking forward to the leftovers for lunch. I made this yesterday. I will definately make this again, it appears very easy to customize. I have to admit though, the prominent flavors were the cheese sauce and the tomatoes. I will have to work on the “eggplant bacon” part, as the flavor was lost when mixed in the Mac. We used a box of gf rice spirals (my first experience with gf pasta) and it was delicious. Very saucy/creamy. I have freshly made Isa’s famous eggplant bacon this morning, and I am a surprise tomato farmer too. This is dinner tonight! Thank you! I made this last night, and I’m about to eat the rest of it for lunch. It is awesome! I followed the recipe exactly, and I am in love!!! It all came together so perfectly! My mom came over for lunch and made me take a picture of it (which isn’t like her at all). She loved it too and took all of the extra eggplant bacon home with her as per usual. I just tried your other mac and cheese with sour kraut and I really can’t believe how amazing it was. Very excited to have a go at this one. Love your creativity! This was yummy, very rich. Large portions. Thank you for introducing eggplant bacon to my life! I ran across this yesterday just after making my menu and shopping list for the week. So, I changed it up a bit so I could make this last night! I was a little skeptical, since I usually don’t like eggplant, but it didn’t taste like eggplant at all. I couldn’t get it crispy after dipping it in the soy mixture though. Have to work on that. And, a note for anyone who doesn’t like arugula (like me), mustard greens were fabulous in this! I thought another strongly flavored green would be good, and it was amazing! I’ll have to thrown in a clove or two of garlic next time, per your note. Isa, some vegan Hare Krishna Devotees I know cook all sorts of amazing food without garlic or onions (for religious purposes). Noting your mention of not wanting to use garlic this time, you might like to know that they use Aesofoetida (also known as Hing) instead. You can get it in pretty much any Indian shop (many health food stores, too). My friend recommends liberal use- like a teaspoon per onion you are substituting for, and three tines that for a clove of garlic. It’s meant to aid digestion, as well- and won’t leave a person, erm, windy, as onions and garlic do to many. The first few times you smell it, it smells RANK!! But you suddenly start LOVING the smell of it after a few uses (strange, I know). It even works well in things like salad dressings. Anyway- thought you might enjoy giving it a go. Keep on cookin’, girl!! You are a food GENIUS!! Is there an alternative for nutritional yeast flakes? Everybody, do yourselves a favour and make/eat this immediately! Back when I ate cheese, my husband was grossed out by Mac and Cheese. He would never even try it. Now that we don’t eat Cheese, he happily tired this. Honestly everything you make it fab. We think we might have your sister tastebuds here in Wisconsin. Your tomatoes look like my tomatoes! So, so incredibly yummy! You’ve outdone yourself again, Isa! I had this for supper tonight, and I discovered that my eggplant had deflated from advanced age. So I used zucchini and it worked great. Now I want to make bacon out of everything. Everything! I wonder if I subliminally saw this recipe before now because I’ve been hooked on making my own version of eggplant bacon the last few weeks. I’ve been adding it to pretty much anything. Next stop will definitely have to be mac n cheese (which I conveniently made twice today for myself and different friends/clients). This was divine! I’m hoping I can heat up the leftover eggplant in the oven tomorrow, as made too much to eat same day. Hubs must have said three times how good this was, and even reminded me to post this review so you knew:) Thanks for sharing with us! This was so good. I only made 1/2 the eggplant bacon (the size in Appetite for Reduction) since it doesn’t keep. I may make mare bacon to serve with leftovers. The lemony cashew pasta suave us great. This turned out great! Had it for dinner tonight. Followed the recipe exactly and ate perfection! I made the eggplant bacon first and was very skeptical. I had a few pieces with sliced tomato & it tasted too Liquid Smokey. But I put all these elements together tonight & I have to say it was quite fabulous. My garden arugula was a little mature so I sauteed to take away some of the sharpness. Another dish that is far greater than the sum of its parts. Whole family loved & fought over the leftovers for lunch. SO good! This is the first of your recipes that I’ve made, and now I can’t decide which of your cookbooks I need more. I used spicy brown instead of dijon mustard, since it was all I had. Still delicious! Tip: don’t let the sauce get too hot. I made the sauce before the bacon was done, and let it sit in the pot on low. The extra heat seems to bring out the vinegar in the mustard much more than when the sauce is fresh. Chilling it overnight brought the flavors back in line though. I made this for dinner tonight and was really wondering how it all fits together. Delicious is all I can say!!! I was really nervous how my family would like it. They loved it. Thanks for the delicious recipe. In safari on Mac, there is no pictures when I press pin it in any of your posts.Is it somethng on your end as I have no trouble with other blogs.. I made this tonight and it was so yummy! Perfect comfort food now that it’s chilly out. I made this tonight and it is delish! There’s so much, though- have you tried freezing leftovers? Nice post, but, dont miss it. Try something colorful, cheerful Asian delicious…. I made this tonight and it was so tasty! I only wish I would have doubled the eggplant bacon. It’s a definite “make again”. yeah, so this was pretty divine, even without the garlic and its like, the first recipe ive ever made without garlic! next time ill truly cut my eggplant thinner. i was nervous about cutting it too thin but the thinnest ones came out best! I’m going to make this for a work lunch on Wednesday. I’m going to heat it up/keep it warm in a crock pot, which I’ve never used before. I’m thinking that I should make the recipe and warm it up once I get to work. I’m thinking of doubling the recipe. Anyone have suggestions on when to start heating it? Is this enough to be eaten alone, or is there a suggestion of what it could be paired with?? My family is new to eating vegan and we have a few nut allergies, any suggestions on substitutions for all the tree nut ingredients in so many of vegan recipies? So, I’ve made this twice now, and I love it. The first time I followed the recipe exactly. I had always wanted to try the eggplant Bacon, but in Canada had not seen liquid smoke (granted I hadn’t looked very hard), but when I was in Boulder, CO it just jumped off the shelf at me (and it was only a dollar, so I figured what the hell, I’d try it). I honestly don’t love it (the liquid smoke). I figure just plain ol’ salt does the trick. Anyway, I made it again last night, but having neither the eggplant, the smoke, nor the time, I replaced the eggplant bacon with some store-bought (but made locally) orangic tamari-baked tofu (I mean really baked – the stuff is chewy). It worked really, really well. So there is another option, and you get a bit more protein too. Thank you Isa for all the delicious cheeze sauce recipes! Do you think this would taste good with quinoa instead of pasta? My SO works in a restaurant and quinoa mac ‘n’ cheese is on the menu, and I’m itching to vegan it up and make it t home! Is this a meal you can freeze? My partner and I are both very busy people, and are always looking for ways to plan our meals ahead. It looks really yummmy. This is our new favorite recipe! The only change that I made was the addition of garlic!! It was so absolutely delicious! Sinful really!! This looks so good. But I have a nut allergy.How can we replace the cashews ? Sooo good! Thanks for this easy delicious recipe. Here are some lovely vegan restaurants…for those days when you don’t want to cook at home. I just made the cashew cheese sauce from this recipet – actually to try it on pizza tonight – and I may eat it all by the spoonful before then. YUM. Thank you! I made this and it is ridiculously, amazingly YUMMMY!!!!! You don’t need to add anything else to this recipe. The ingredients are perfect. Thanks Isa its a keeper! I’m the same way with my plants, to the point that I don’t like traveling in the summer. Tomatoes just taste better when you grow them yourself. I made this recipe a couple of days ago, and it was delicious. Then I sent the link to a fellow veg*n who is craving something cheesy. I think I’ll make the sauce again and freeze it so I have it ready to go next time. Thanks for posting! !